As soon as my eyes came across the press release images, the word ‘transparency’ immediately came to mind; although lately ‘transparency’ has tended to be a bit of a cliché, where transparency is called upon all over; in governments, business, and in some countries transparency in religion! 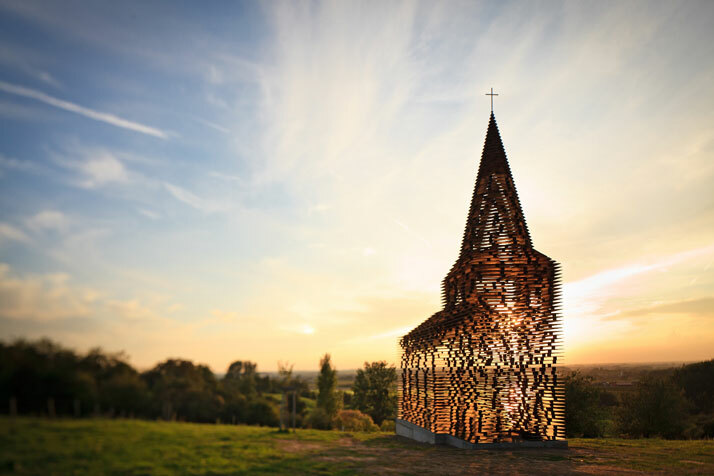 Belgian architects Pieterjan Gijs and Arnout Van Vaerenbergh have taken the concept of transparency literally into a church, as they have constructed a transparent, see-through church in the Belgian region of Haspengouw. 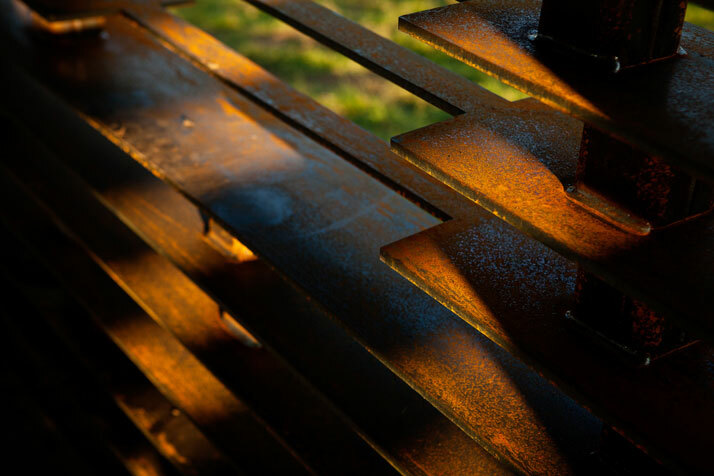 The project is an ambitious long-term art installation in public spaces which will be realized in different locations in Limburg, the Netherlands over the five next years as part of the Z-OUT project for Z33 House for Contemporary Art. 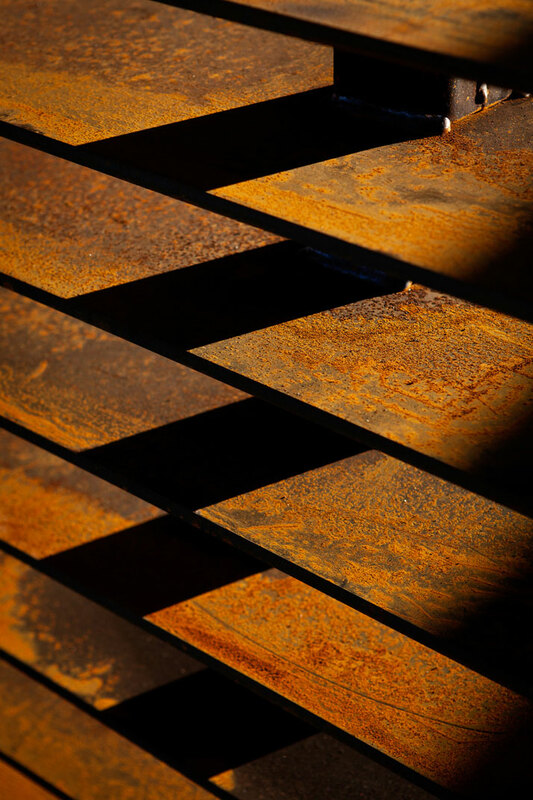 The ten meter structure is made of 100 stacked layers and 2000 columns of steel plates, positioned in such a way as to allow visitors to almost walk through the walls. According to the point of perspective, the church can be perceived either as a traditional church structure, yet with the change of perspective the seemingly solid walls seem to disband before one's eyes in the landscape. 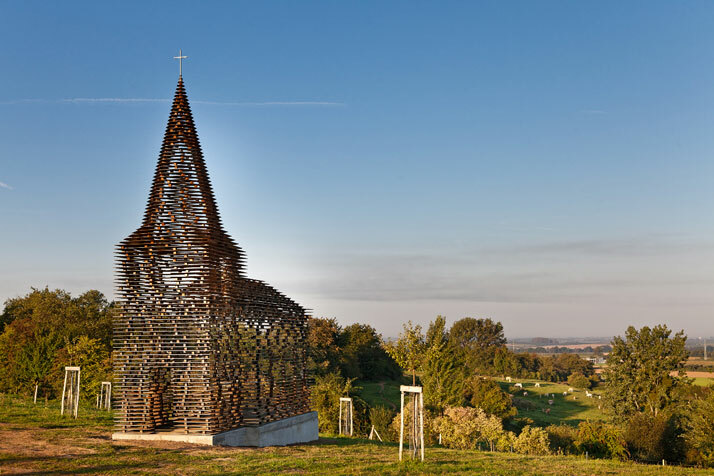 An equally perplexing image can be perceived when one looks out to the landscape from the surrounding countryside which is redefined by abstract lines of the church’s architecture. The play of light and shadow is another interesting aspect which is only perceived when the viewer is in the church. During different times of the day, the church interior changes, according to the position of the sun and the direction of the sun light. The play of light and the shadows creates a feeling of supremacy, spirituality and of something supernatural conveying religious emotionalism. The church design is based on the architecture of a vast number of churches in the region. 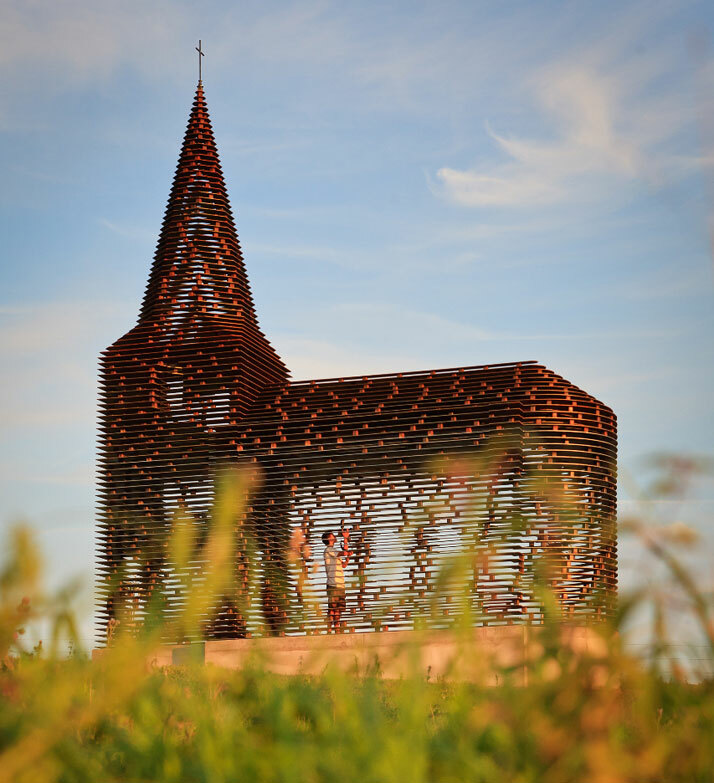 What makes it strikingly different is the use of horizontal plates; the concept of the traditional church is now transformed into a transparent object of art. But what about the material used for the construction? 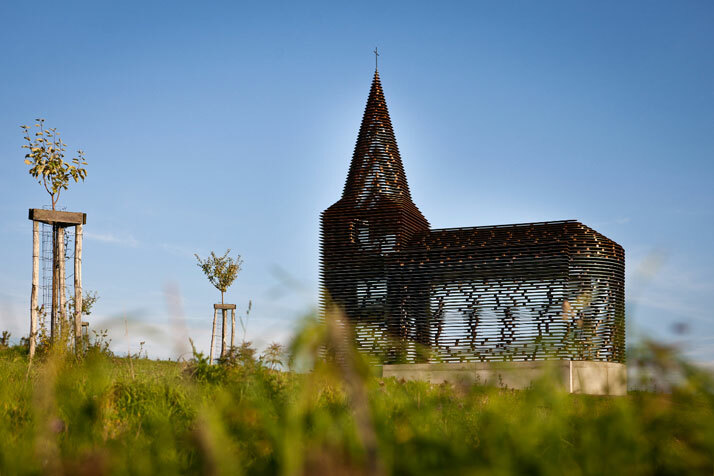 The application of steel – a rather bold material - metaphorically makes a statement about the bold relationship of church and religion in the Netherlands. 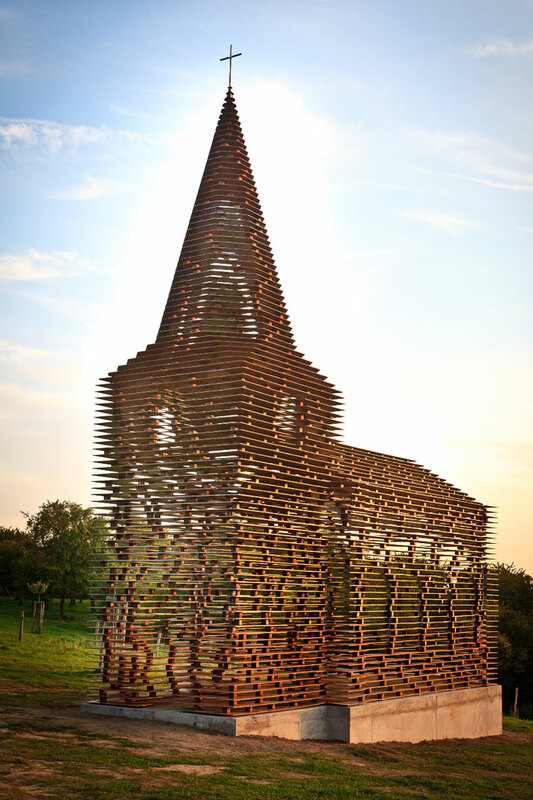 According to the architects, the amount of church goers is constantly decreasing; the churches themselves are falling into disuse more and more often, therefore the future of these emptying and abandoned churches is a current issue among several artists. 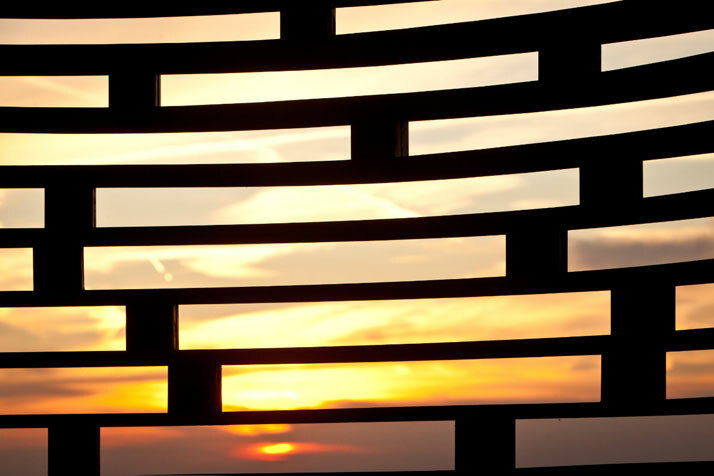 With this information in mind the architects in cooperation with Z33 named this project ''Reading between the Lines'' - to perceive or detect an obscure or unexpressed meaning – translating the meaning of transparency from the realm of information to the realm of the observable, the evident and the real. 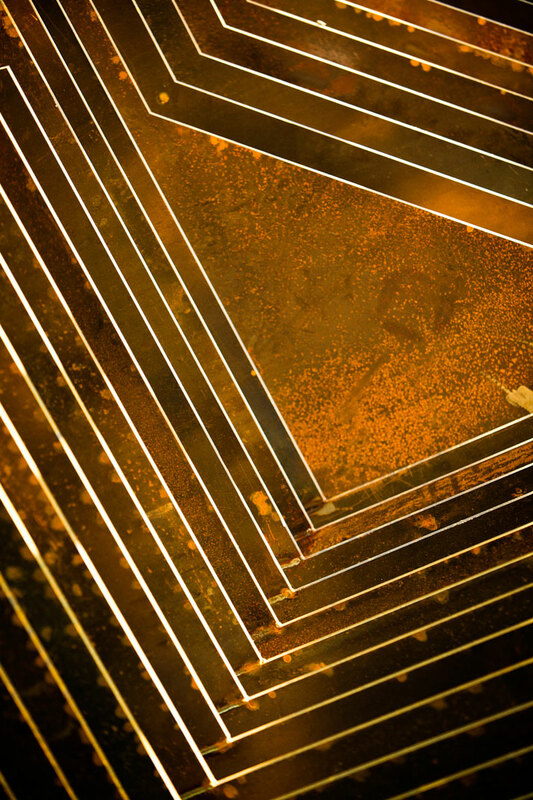 While the traditional understanding of transparency refers to knowing everything there is to know, 'Reading between the Lines' extends the idea of the transparent as the unseen or even the covert. To not see does not necessarily mean it does not exist. As the title displays, the burden of transparency is not only on the church, or on the artwork, but on the spectator as well, who must learn to read between the lines. In conclusion, Gijs and Van Vaerenbergh in collaboration with Z33 for the Z-OUT project introduce art, through architecture, into a public space that enters into a dialogue with its surroundings both formally and content-wise. 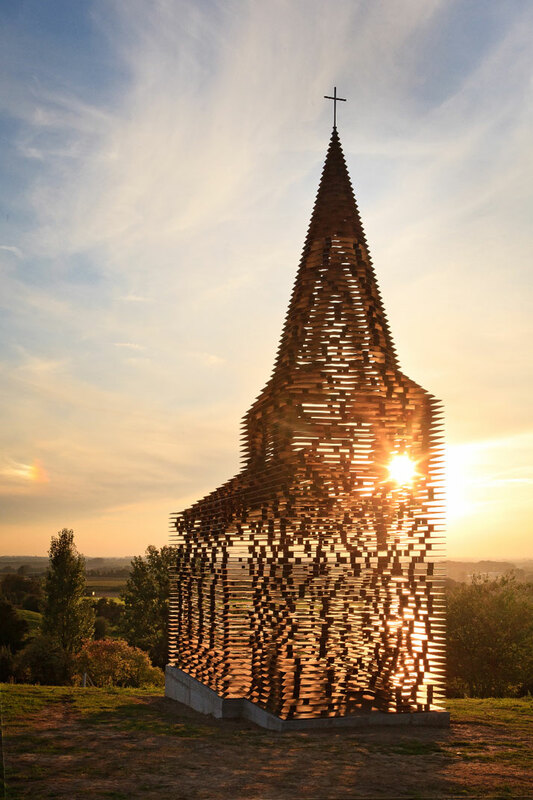 Passers-by are challenged to consider the meaning of a church as an architectural building and as a religious symbol in a whole new way as the landscape embraces a multitude of stories that are not always perceptible at first sight. Remember, to not see does not mean it does not exist but to learn how to look differently at everyday objects… Read between the Lines. The duo Gijs Van Vaerenbergh is a collaboration between young Belgian architects Pieterjan Gijs (Leuven, 1983) and Arnout Van Vaerenbergh (Leuven, 1983). 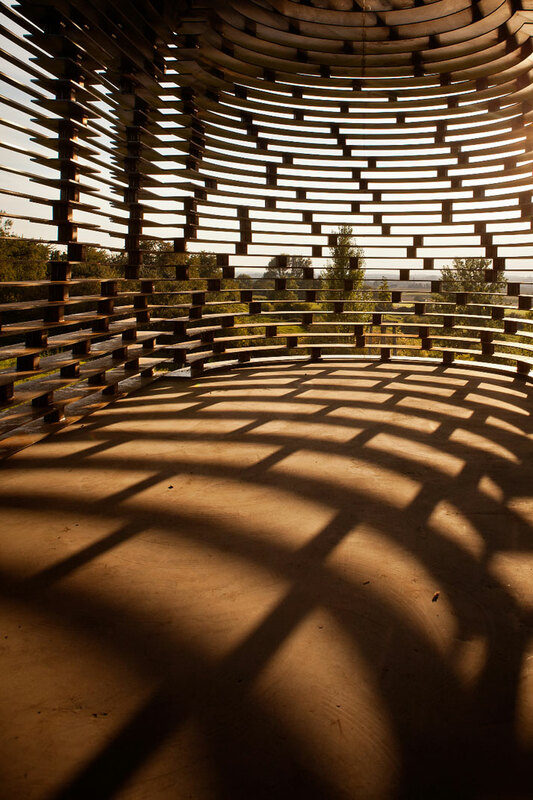 Since 2007, they have been realizing projects in the public arena that derive from their architectural background, but clearly display an artistic intention. As such, their projects do not always originate from the customary commission and carry a large degree of autonomy. Their primary concerns are experimentation, reflection and a physical involvement with the end result and the input of the viewer.